My new video/sound installation, i dream in your language, will be presented at this year’s SoundWalk, “a one-night event of sound installations by over 50 local and international sound artists.” Works are spread throughout the area encompassed by Broadway, Atlantic Avenue, Ocean Boulevard, and Elm Street with a sound corridor on 1st Street that will connect the East Village and Pine Avenue. The art is exhibited in a variety of indoor and outdoor spaces. Mine will be at Phantom Galleries on the southwest corner of 3rd and Elm Ave.
still from ch. 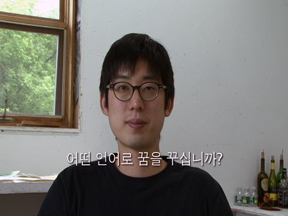 1 of "i dream in your language"
still from ch.1 of "i dream in your language"
John and I have been finalizing the English to Korean translations for my video project (i dream in your language – to be shown at SoundWalk on Oct. 3) and I am realizing how nuanced this whole process is. With four bilingual friends helping, we ended up with several slightly varying interpretations of the interview with Jonggeon Lee. So far I have 5 more interviews to translate, and several more to shoot. The project is becoming bigger than I imagined, and I am excited about it – enjoying the process, and trying to figure out how represent it in this piece or in another one. i dream in your language began at VSC when I saw that Le Kinh Tai was using google translate, which is often inaccurate, to communicate with all the rest of the residents. This morning Jeremy sent me an article about the UN interpretation process, which also seems to sometimes result in inaccuracies. Sounds Dangerous. If any of you speak multiple languages in addition to English and want to participate in this project let me know. I still would like to interview people speaking German, French, Arabic, Hebrew, Hindi (Nicole I will interview you in Nov.), Japanese, Tagalog, and any Eastern European and/or African languages/dialects… I ask three questions in English and you respond in your native language (or language of preference): 1. Where are you from and what languages do you speak? 2. What is it like to communicate with people who don’t speak your native language? 3. What language(s) do you dream in?